Identify the barriers that are preventing you from having a balanced life and explore what the Bible teaches about Christ-centered living. 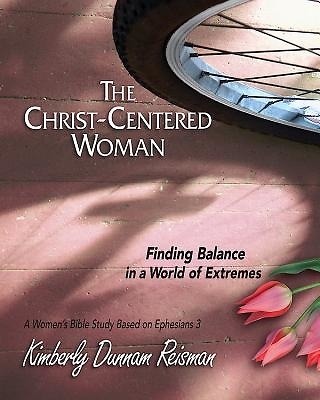 In this six-week in-depth Bible study, Kimberly Dunnam Reisman helps women to find balance at every age and stage of life. Confronting the daily chaos of competing demands from a new perspective, she asks not “How do I juggle my responsibilities?” but “How do I make choices that reflect my relationship with Christ and his direction for my life?” Using chapter three of the Apostle Paul’s letter to the Ephesians as a biblical foundation, the study identifies barriers to balanced living and explores what the Bible teaches about Christ-centered living. Women will discover how being centered in the Savior can help us contemplate, sort, and prioritize our callings. Through it all, we come to experience Christ as Rock, Solace, and Guide and find him the calm center from which we can wisely navigate the responsibilities of our lives. The Participant Book guides women in a biblical study of Christ-centered living, using Ephesians 3 as a foundational framework. Five devotional readings are provided for each week. The interactive format includes space for responding to questions and recording personal reflections.